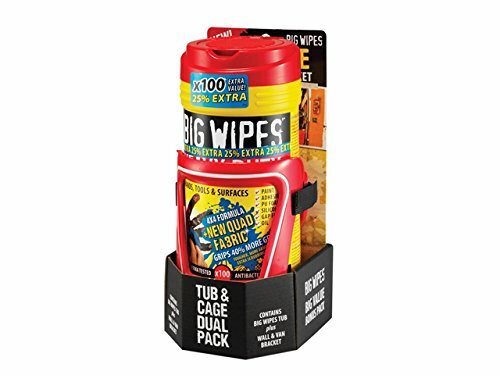 The Big Wipes Heavy-Duty Quad Fabric wipes have increased strength and greater absorbency than ever before, which makes them tougher in use and able to soak up extra grime. Incorporating the latest high adhesion web technology, the abrasive Quad Fabric grips 40% more grime with every wipe. Big Wipes are antibacterial and provide added protection against MRSA, E.Coli, Salmonella, Listeria, Clostridia, Enterococcus, Pseudomonas, Staphylococcus Aureus and Weils Disease. The wipes clean a vast range of substances, including general grime, grease, oil and water-based paints and coatings, PUR and instant-grab adhesives, silicone and acrylic sealants, PU foam, EPOXY fillers and grouts, oil, tar, inks and permanent marker. Supplied with the Big Wipes Van & Wall Bracket, that allows ‘one-handed dispensing’ for those very messy jobs and means no more looking for your tub of Big Wipes. Simply push a Big Wipes tub into the bracket, tighten and you’re ready to dispense. It is wall and van mountable, fixes to ply panelling or integrates easily into a bespoke racking system.